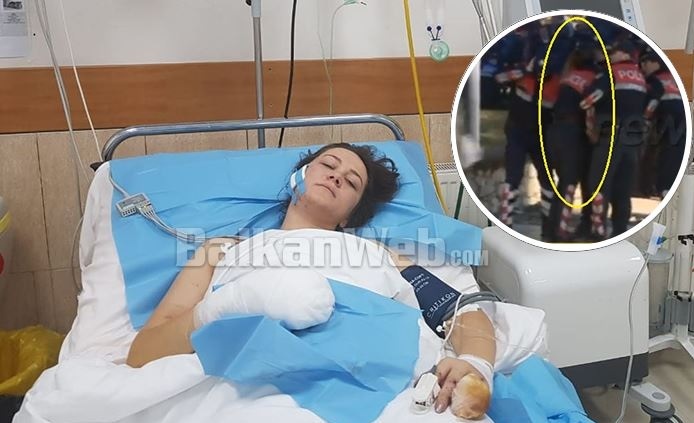 With two fingers and bandaged neck, lying in the hospital bed after the operation, is the image by BalkanWeb of the policewoman wounded today during the protest of the residents of the 'New Ring' in the Parliament against the demolition of their apartments. During the collision with the residents, the 24-year policewoman of Eagles Forces, Ina Nuka, left the scene with screams assisted by her colleagues waiting for the ambulance. According to Oculus News sources, a firework thrown in Nuka's neck by protesteers and her effort to get it off in time with her hands, made her of losing 2 fingers.